The Battle of the Khadairi Bend is fought as a prelude to the main offensive at the Second Battle of Kut. The highly fortified Turkish defenses at Khadairi Bend are positioned in two deep trench lines at the north of Kut in a loop of the River Tigris along the left bank. The British operations are overseen by newly-installed regional Commander-in-Chief ‘Sir’ Frederick Maude. British sappers began to dig positions underneath the Turkish lines back on 22nd December 1916 with the objective of capturing the Turkish outposts. Within two weeks they had succeeded in digging to within just 200 meters of the Turks’ eastern position. Following a series of diversionary attacks launched along the Tigris the last two days and preceded by an unusually effective artillery bombardment, a major British assault against the town is begun. British progress is good in the face of impressive Turkish opposition. 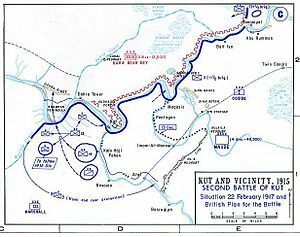 Khadairi Bend itself will fall, after heavy fighting (including two concerted Turkish counter-attacks), on 29 January. With Kut secured the following month Maude briefly paused before continuing onwards to seek the politically spectacular capture of Baghdad, which duly falls in early March. Lieutenant Colonel Henry Francis Dundas Stirling MC (Indian Army Reserve of Officers commanding 59th Scinde Rifles) is killed in action at age 33. The Battle of Magruntein (or Battle of Rafah) begins. At 07:00 the Turkish garrison is isolated by the cutting of the telegraph lines to Gaza and the British horse artillery batteries commenced firing on the redoubts. The bombardment begins at 09:30 and ends thirty minutes later. Around 10:00 a party of Turks attempt to escape up the road towards Gaza but are intercepted by the Canterbury Regiment of the New Zealand brigade who capture 171 prisoners. The attack commences with the dismounted troops advancing from the east and south. The 3rd Light Horse and 5th (Yeomanry) Brigades are initially held in reserve but are quickly sent to join the attack so that by 11:00 a ring of infantry is advancing on the Turkish positions. However the Turks are in a strong defensive position and their redoubts are ideally placed to provide supporting fire for each other. The Turkish position is located at El Magruntein, about one mile south of the Rafa police post on the border. A bare hill, named Hill 255, dominates the surrounding country which is utterly devoid of cover. The Turks have constructed four redoubts; one on the summit of Hill 255 and three more to the west, south and east of the summit, named “A”, “B” and “C” Redoubts respectively. By 12:15 the New Zealanders have closed to within five hundred meters of the enemy trenches but they can make no further progress. In most places the attacking troops are exposed to direct fire from the redoubts so a constant stream of fire is maintained on the Turkish parapets to protect them. As the afternoon wears on the attacker’s ammunition begins to run low. When their machine guns begin to run out of ammunition the quartermaster of the Wellington Mounted Rifles brings up 24,000 rounds of small arms ammunition at the gallop while the Inverness Battery of the horse artillery runs out of shells and has to withdraw. General Chetwode is now becoming worried. Prisoners have told him that he is facing 2,000 Turks, supported by four mountain guns and by German machine gunners, and that another regiment is on its way to reinforce the garrison. Chetwode calls for a last concentrated effort by all assault forces. Chetwode and Chauvel are well aware that the Anzac Mounted Division comprises the majority of the mounted troops available to the British in the Egyptian theatre and consequently they are not willing to sustain significant casualties. he attack gains no ground, and by 16:00 the situation is critical. Chetwode decides to break off the attack. Orders for the withdrawal are issued, and some assault units immediately pull back. However, the withdrawal order has not reached Chaytor. At the same time Chetwode is issuing his withdrawal order Chaytor issues orders for a brigade advance. From the north, the three regiments of the New Zealand brigade charge over a mile against the main redoubt on Hill 255. At the same time, the camel brigade charges from the south against the ‘B’ Redoubt. Seeing these attacks going in, the 1st Light Horse Brigade moves in from the east against the ‘C’ Redoubt. In all cases when the attackers get into the Turkish trenches, the defenders quickly surrender and as each redoubt was taken, the resistance from the other redoubts diminishes until by nightfall the entire position has been captured. Private Frank Robert Morse-Kincaid (Imperial Camel Corps) killed in action at age 21. His brother will be killed in August next year. The Turks have lost about 200 killed, 162 wounded and 1,473 unwounded prisoners. This battle clears the Turks out of the Sinai desert in Egypt, and General ‘Sir’ Archibald Murray is authorized an advance into Palestine. The battleship HMS Cornwallis is sunk sixty miles southeast of Malta by three torpedoes fired by the German submarine U32. Fourteen crewmen are killed. Six Royal Flying Corps aircraft bomb Beersheba airfield, the first of five raids carried out over the next week. Commander ‘the Honorable’ Richard Orlando Beaconsfield Bridgeman DSO (Royal Navy, HMS Hyacinth) drowns at age 37 when the engine of his Short 826 fails near Kiombini while flying from HMS Himalaya in East Africa. He is the son of the 4th Earl of Bradford. Major Gilbert Horsman Soames (West Yorkshire Regiment) is killed in action at age 37. He is son of Arthur Wellesley Soames MP and he had served in the Lancashire Fusiliers during the South African War. His brother was killed in September 1916. Captain and Adjutant William John Arbuthnot (Indian Army Reserve of Officers attached Sikhs) is killed in action at age 31. He is the son of the late General ‘Sir’ Charles Arbuthnot GCB. Captain Herbert Raymond Wilson (Mahrattas) is killed in action in Mesopotamia at age 22. He is the last of three brothers to die in the Great War the others both dying in September 1915. Second Lieutenant William Walter Campbell (Manchester Regiment) is killed in action at age 24. His brother was killed in May 1916. Acting Bombardier John Curtis (Royal Field Artillery) is killed. He is one of three brothers who are killed in the Great War.